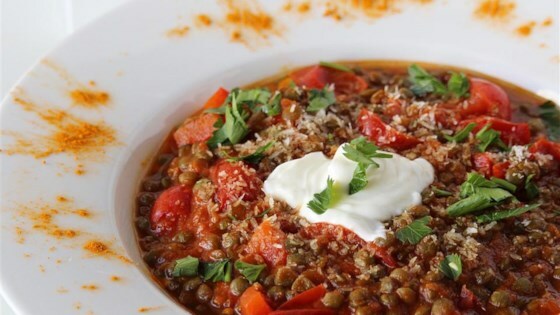 "This is a wonderfully bright and healthy recipe that I created one day when I was looking to use up the rest of my red lentils and fell in love with this flavor combination. Brown lentils could probably also be used, but would require more cooking time and more water for simmering as the tiny red lentils cook much faster than brown. You can add your own spices to your taste preference. I think crushed pineapple would work well in this recipe for more of a tropical flavor." Heat olive oil in a large skillet over medium heat. Add onion, green bell pepper, red bell pepper, garlic, tarragon, curry powder, salt, and black pepper; cook and stir until onion is softened, about 5 minutes. Stir in diced tomatoes; bring soup to a simmer. Stir red lentils and coconut into the soup; mix well to combine. Simmer soup, covered, adding water as needed, until lentils are tender, 15 to 20 minutes. Beautifully seared scallops with wilted arugula, butter beans, and lentils. Use broth instead of water if preferred. Delicious!!! I haven't ventured into the world of lentils before but so glad that I did. Added more tarragon and curry. Love it. Yummy, easy recipe. I loved this recipe. So to have some leftovers I doubled it. I added a can of coconut milk and since I like spicy dishes I doubled the curry and added cayenne to taste.